The ElectroPrep system is an extremely versatile sample prep technology developed by Harvard/AmiKa scientists. This patented, electrophoresis-based system is ideal for the rapid purification of proteins, nucleic acids, carbohydrates and other biomolecules. With a run-time of 5 to 10 minutes. ElectroPrep provides speed and convenience, even at the very low currents (5 to 10mA) used with this system. The sample and elution chamber are both made of PTFE, a completely, inert material especially suited for high sample recovery. Membranes of differenct MWCO (molecular weight cut off), from 100 to 300,000 Daltons, can be used for selective elution, filtration, dialysis, fractionation and concentration. See below for a full list of membranes available. 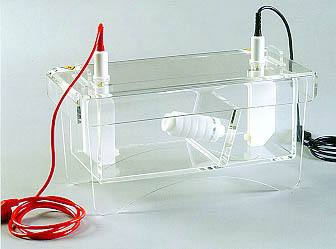 A large variety of membranes are available for use with the ElectroPrep unit. The following tables are designed to assist you in choosing the appropriate membranes for your needs. These membranes are low protein binding and have a sharp MWCO range. The membranes are pre-cut, pre-washed, and supplied in 0.05% sodium azide solution. They are ready to use without any further treatment. Glycerol, sulphur, and heavy metals are not present in these membranes. The cellulose acetate membranes are intended only for aqueous solutions, and the presence of an organic solvent is not recommended. These membranes are more stable in organic solvents, but the MWCO is not as precise as for cellulose acetate membranes and are not offered over as wide a range of MWCO. The membranes are pre-cut, pre-washed, and supplied in 0.05% sodium azide solution. They are ready to use without any further treatment. Glycerol, sulphur, and heavy metals are not present in these membranes. These membranes are more stable in organic solvents. They are available in three highly controlled pore sizes for a well defined MWCO range.